In an effort to be healthier and eat more fruits and vegetables, I recently joined a CSA-box delivery program and started bringing my lunch to work. This recipe is making me looking forward to my lunch today: I had a salad at Cucina Enoteca recently that was so delicious yet simple that I jotted down the ingredients and attempted to re-create it at home. The restaurant version has “lemony-roasted beets,” microbasil and pistachios. My version has “what I had on hand that was similar.” Since I cook with the Eyeball, Pinch and Taste method, all measurements are approximate. No, this is not all I am eating for lunch. This is just the healthiest most photogenic part. Makes one serving in no time at all. 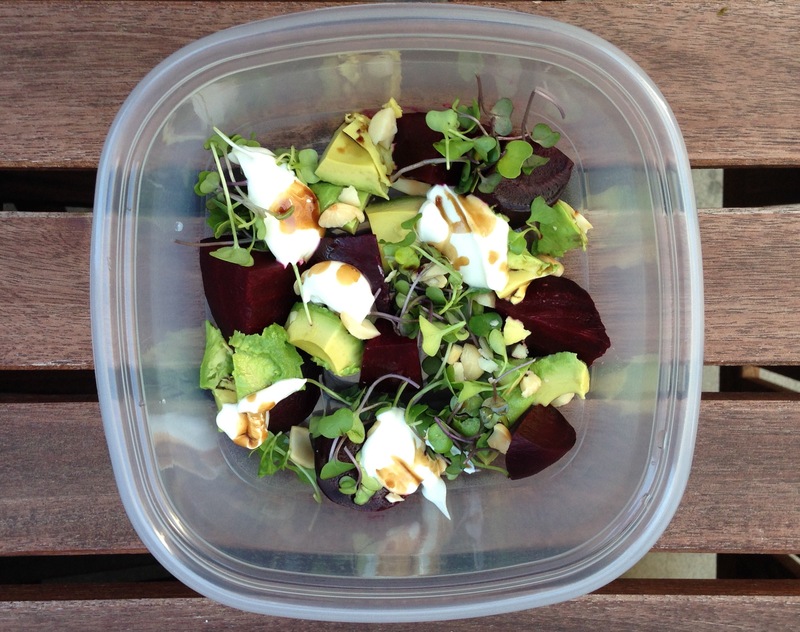 Cut beet(s) and avocado in cubes and plate. Sprinkle microgreens around the cubes. Stir a drizzle of honey into the yogurt and add dollops in an arty fashion. Sprinkle with chopped almonds. Drizzle with a tiny bit of balsamic vinegar. Enjoy. Instead of yogurt, I would imagine that dollops of soft goat cheese would be quite tasty too.